A perfectly seasoned tuna steak that makes an ideal Weight Watchers lunch or dinner recipe, this Seared Ahi Tuna is absolutely delicious. It’s packed with healthy fat and protein and works wonderfully over a salad or rice. It also cooks really fast, so this is something you can get on the plate quickly. I actually prefer mine a little more undercooked, but since my kids were eating this dish too, I opted to cook it a little longer, as you can see in the photo. But the delicious ginger and soy flavors balance the the delicate tuna perfectly, without overwhelming it. This is definitely an easy fish recipe that tastes great, can be prepared by anyone, and is low in Points. Perfectly flavored and deliciously light, these low calorie seared Ahi tuna steaks are loaded with protein and make a very satisfying meal. Serve over rice, salad, or just as is for an excellent Weight Watchers lunch or dinner. In a medium sized bowl, combine all ingredients except the tuna to create a marinade. 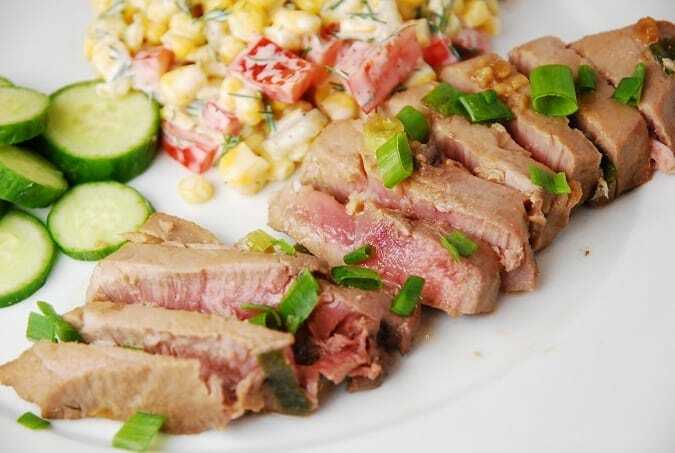 Slice tuna steaks into 4 fillets and place into marinade. Cover and refrigerate for at least an hour. Spray a large, nonstick skillet with non-fat cooking spray or an olive oil mister, and set over a medium high heat. Once the skillet is hot enough, sear the tuna steaks for a minute to a minute and a half on each side, or longer if you prefer them less rare. Remove from pan and slice into 1/4-inch thick slices. Garnish with additional green onion slices. Yum, we make this a lot. I love serving it over a salad!